Prosciutto Wrapped Chicken with Fennel Frond Pesto – Odds & Hens : Ramblings. Creations. Twenty-one weeks ago I pinned a delectable recipe of what appeared to be asparagus, prosciutto, chicken and a cream sauce. But won’t you know it, I went to plan my dinner prep only to find the whole thing was in a foreign language, that I now know to be Polish. Lacking initiative (apparently), I changed plans and dished up the tried and true classic, cereal for dinner. Ok, some other stuff came up too, like no hubby for dinner and really hungry. When walking home a few days later, listening to another food novel and thinking about dinner plans, it suddenly dawned on me – just copy paste the text into a web translator to get enough of a clue about that cream sauce. I could wing the rest. Besides what’s there to lose? I still had cereal. 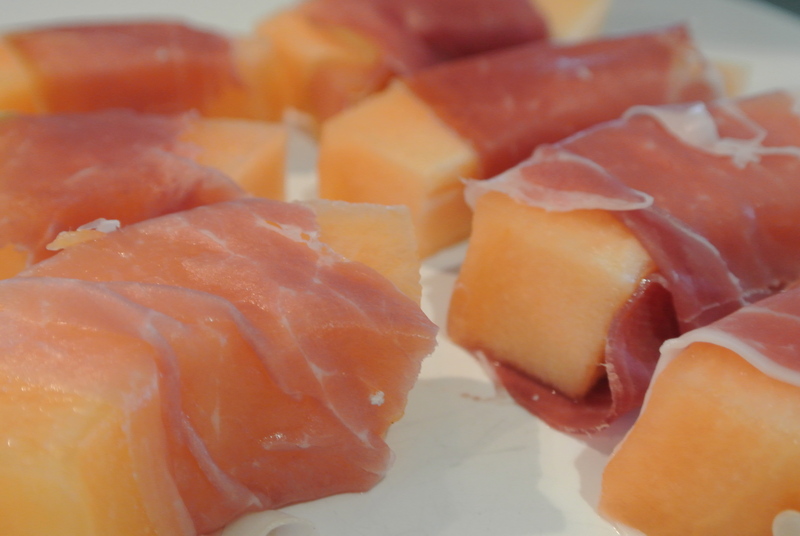 And an easy appetizer: prosciutto wrapped cantaloupe! Dry chicken and pat with flour. Wrap with prosciutto and brown on each side for 3-4 minutes in fry pan with about a tablespoon butter and 1-2 tablespoon olive oil. I lost track of time and mine is a little more “crispy” than planned but still tasty. Stick pan (better be oven safe) into a 375F oven and finish cooking chicken, maybe 20 minutes or so. Put all the veggies in a bigger than necessary pan with some butter and sauté them. Once done, if the other stuff (chicken and cream sauce) isn’t quite ready, turn to simmer or move off burner for a few. This cream sauce is super simple. I used about a 100 ml of half and half (your liquid measuring cup should also have mls) and about a 1 tablespoon or more of the pesto. Mix together. When chicken is done, pull out of oven. Turn the heat back on under zucchini if you paused it, add the cream sauce, put the cook chicken in the vegetable pan for a quick minute while you heat the cream through and let the flavors mingle. Translation services provided by moi-self supported by Bing Translation (even though I don’t “bing” often). Below is a snap shot of the direct translation. Some things just don’t come across and sound like sneezes. This experiment opens up some many more possibilities for cooking and trying new and old recipes. I leave you with a Polish proverb and its translation, of course, to ponder. Z niczego nic nie będzie. From nothing nothing can come. Strauss, Emanuel (1998). Concise Dictionary of European Proverbs (Abbreviated ed.). Routledge. p. 238.
Who threw the spices out? Who? Who? Who-oo?